I have been painting for as long as I can remember and I have been needlepointing since I was about 10 years old. Two very special people have been integral in helping me find this career; my grandfather Poppo and my mother Rosanne. They have instilled in me a passion for art in all of its manifestations, a love of expressing myself through arts and crafts, and a belief in myself that I can do anything I put my mind to. My grandfather taught all of his grandchildren how to paint with acrylics and welcomed us into his studio at an early age. My mother has been a talented craftswomen all her life; sewing us dresses as children, cross-stitching sharks on sweatshirts for her nephew, needlepointing any canvas she can get her hands on. Inspired by my grandfather’s love of painting and my and my mother’s love of needlepoint I have decided to start hand-painting needlepoint canvases. My canvases are all painted lovingly and painstakingly by hand on the table on which my grandfather used to paint. I find inspiration in modern art, fashion, children’s books, folk art, interior design, graphic design, and so many other fields. My previous work as an Interior Designer gives me a keen eye for color, shape, and spacial organization. I hope my canvasses reflect my varied tastes and that you find something you love. Many people have supported me in my dream to create art for a living, most especially my husband, father, mother, and sister. To all of you I say thank you for your help. I am so proud to say my company’s name is the nickname my brother used to call me. It warms my heart to know he is somewhat a part of this endeavor even though he is no longer with us. 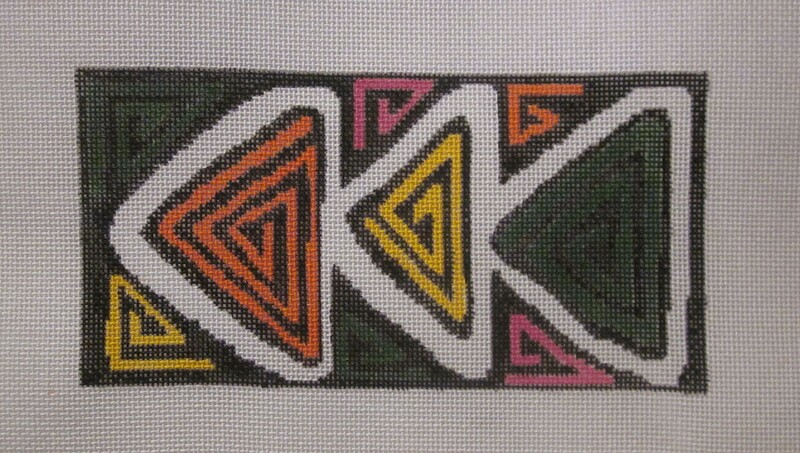 The first canvas I am posting is a design inspired by a needlepoint canvas Poppo painted for me a couple years ago. It is titled “Poppo’s Triangles” and its size (3.5″ x 7″) makes it perfect for stitching up and making into an eyeglass case, but it could be anything you want. I’ll be posting more canvases soon, so stay tuned!